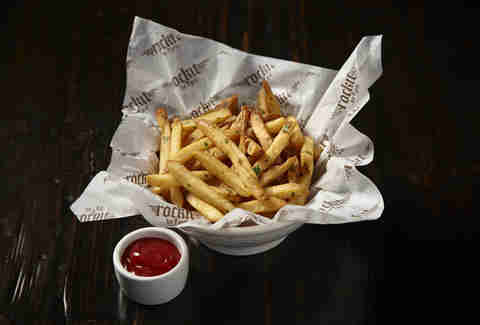 Fries are the Dwyane Wade to burger's Shaquille O'Neal. The Robin to burger's Batman. The Dwyane Wade to burger's LeBron James. But just because Dwyane Wade rides everyone else's coattails doesn't mean America's favorite potato stick has to. Especially not in Chicago. 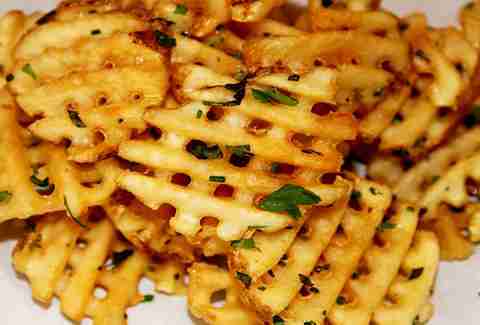 Here are 14 places in Chi where fries are the superstars. French fries are typically finger food, but sometimes you need a classy, plastic fork to get the job done... like with Edzo's loadeds, which aren’t trying to bury lackluster spuds (these fries are tremendous on their own), but are trying to make them even better by adding obvious better-makers like bacon, Merkts cheddar, green onions, and sour cream. When you hear "loaded fries", you might think of toppings like cheese and bacon, but Korean street BBQ restaurant Del Seoul does things a little differently. 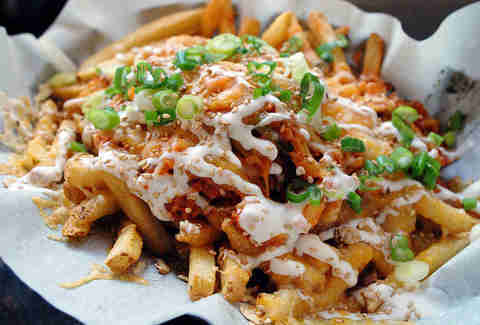 Their kimchi fries are topped with sautéed k-chi, onions, pork belly, scallions, melted cheddar, Jack, and sour cream. It’s basically the Korean version of 'Murica food. 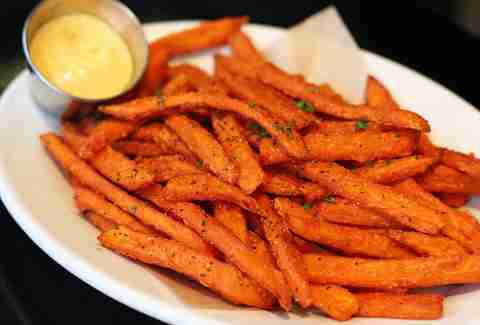 Sweet potato fries tend to get a bigger margin of error, because people don’t know the difference between good and great ones. 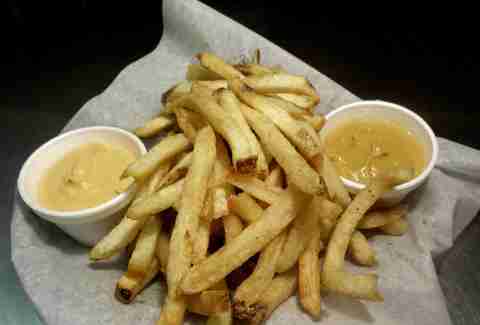 Just because they’re sweet doesn’t mean they have to be soggy though, as proved by DMK’s, which're as crisp as any perfect, normal fry, but're perfectly balanced with a sweetness-cutting Lemon Tabasco Aioli sauce. Warning: you might finish off the sauce with your finger if you only order a small. Billy Dec posts a plethora of food photos from his restaurants, but there's no tastier-looking selfie than Rockit’s truffle fries. They’re oversized slices of potato Heaven, crispy on the outside, and so pillowy inside that we're always tempted to squeeze their guts right onto our plate and take a nap. 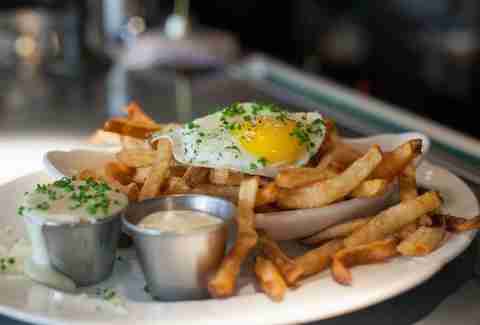 Next to a phenomenal burger, Au Cheval's extra-crispy fries are topped with a fried egg and Mornay sauce -- fancy speak for white sauce with cheese -- and an accompanying side of aioli that ensures that these spuds are richer than Scrooge McDuck. So, basically, infinity rich. French fries tossed in Japanese spices and served in a Korean restaurant. What could be more American than that? These spiced slices are tossed in togarashi (a tremendous Japanese chili blend) and served with curry mayonnaise. We typically have the same reaction to mayo and fries as Jules Winnfield, but in this case it’s a must-dip. They say size matters, and this might be the only time when it’s the little fry that gets the job done best. If you can look past your diamond-marked steak, you’ll see a giant bowl covered with a bulging black cloth. Underneath lies the biggest pile of shoestring fries you’ll ever see. They’re cooked to perfection (unlike most shoestringers), and Mastro’s likes to keep it classy, so they’re garnished with the most useless herb in the kitchen: parsley. It’s rare to find a great fry in a shawarma shack, but BenjYehuda gets the job done, and then some. 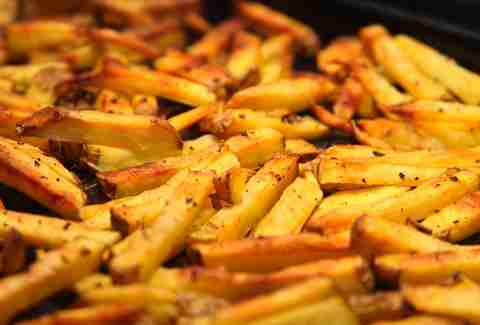 No matter how slow or busy the minimalist restaurant is, their taters are always extremely hot, fresh, and crispy. Plus, it’s only $2.69 for a FULL POUND OF FRIES, making it quite possibly the best deal in the Loop. Add in a side of Merkts cheddar, and it’s all the lunch you’ll need. 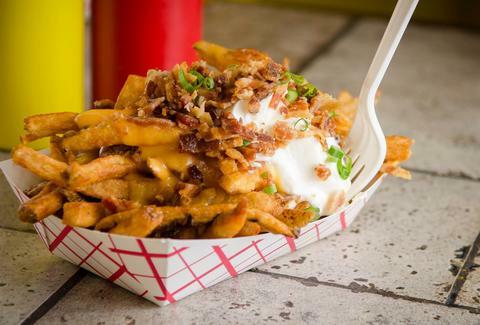 Frank 'N' Dawgs is home to the fanciest dogs in Chicago, but their fries are on point, too. Most places use truffle oil for seasoning, but they triple up by adding truffle butter and truffle salt as well. Who says you can’t look classy while eating at a hot dog joint? Frietkoten Belgian fries and beer is just one of the many venders in The French Market, but they somehow do fries better than almost anyone in the city. 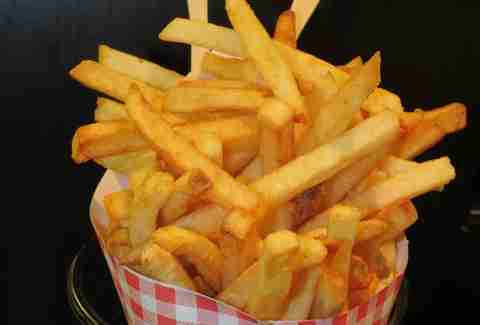 These foreign frites are double-fried to hit that perfect balance of soft on the inside, and crispy on the outside. The array of dipping sauces -- half the reason we eat fries in the first place -- is vast, and you basically can’t go wrong with curry ketchup. Really, you can never go wrong with curry ketchup. 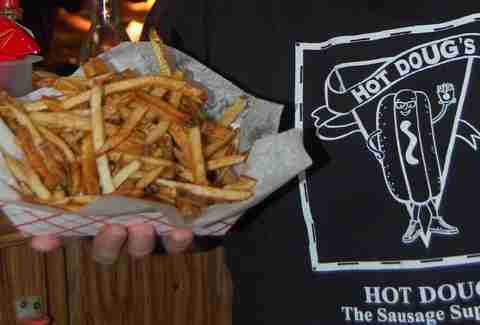 I don’t know who first realized that duck fat was perfect for fries, but Hot Doug’s certainly perfected the practice. These thin-cut fries don’t look like anything special in the standard hot dog joint container, but you’ll know why everyone raves about them the moment you bite into one. The only drawback is that they’re only available Fridays and Saturdays, so you should probably get a couple/50 orders while you’re there. 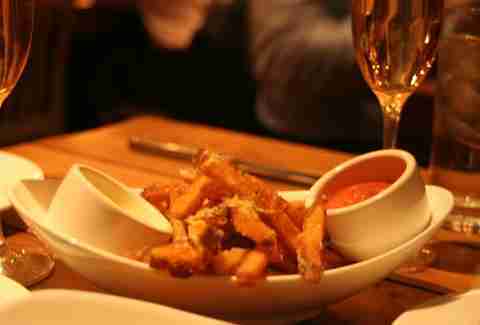 The menu at The Bristol changes frequently, but you can always count on their duck fat fries to be waiting for you. The Bristol accompanies theirs with house-made ketchup (which isn’t a sugar-bomb like Heinz) and garlic aioli, both of which are the perfect complement. If you manage to read past the master-tater tots on the menu, you’ll be rewarded with the most underrated fries in the city. Fitting of one of Chicago’s best beer bars, their fries are beer-battered to perfection, making them crispy in a completely different way than the other top spots on this list. 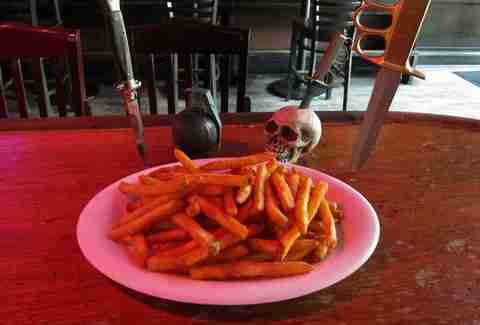 And nothing goes better with these fries than their extensive beer menu and metal playlist. This isn’t technically in Chicago, but they’re too good to ignore. I first discovered Wiener and Still Champion when they followed me on Instagram. That alone earns them a spot in my heart, but their double-fried fries more than warrant my loyalty. They might be some of the best naked potato sticks in town -- well, near town -- but that doesn’t mean you shouldn’t try them with any number of dippin’ sauces. 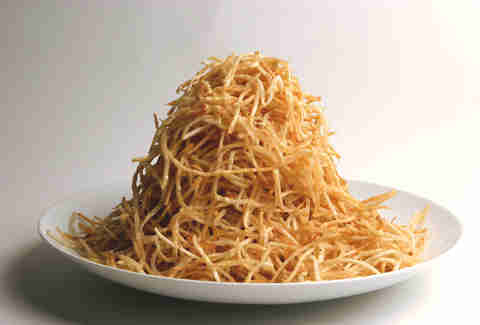 Colin Joliat is a freelance food and booze writer who studied French fry management at Good Burger with Kenan and Kel. Follow him @FlintSkinny.